Companies are trying to find a workspace setup that increases employee productivity. Meanwhile, the employees are hoping that they will be allowed to concentrate or collaborate as needed and still escape unnecessary distractions. Getting the design of an office right can be hard – it is clearly a moving target. 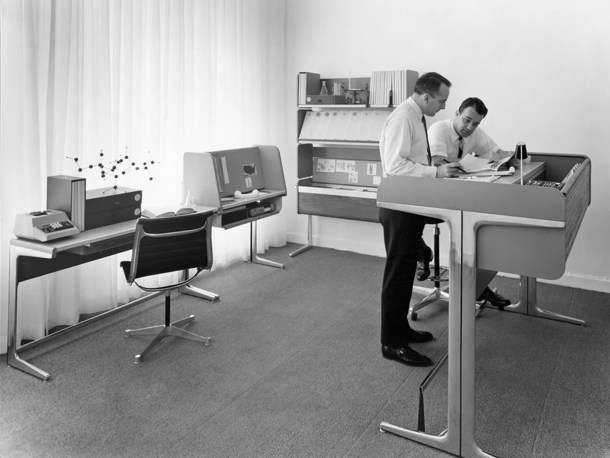 Let’s take a look back at the history of office design. In 1964, a Herman Miller executive, Robert Propst, came up with the idea of the office cubicle. It was a reaction to the open office setups of the 1950s which were felt to be too noisy and lacking in privacy. A 1960s escape from the vast open office layout. The office cubicle found huge adoption in the following decades, giving workers an office layout that was often an immense field of cubicles as far as the eye could see – as was so effectively lampooned in both the movie Office Space and the comic strip Dilbert. 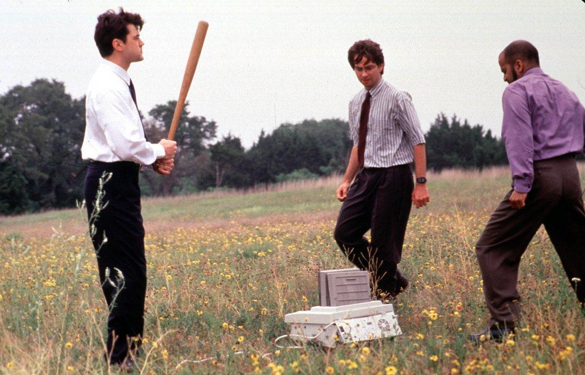 Ron Livingston, David Herman And Ajay Naidu take their revenge on their nemesis, the office fax machine in a scene from “Office Space”. Source: Getty Images. 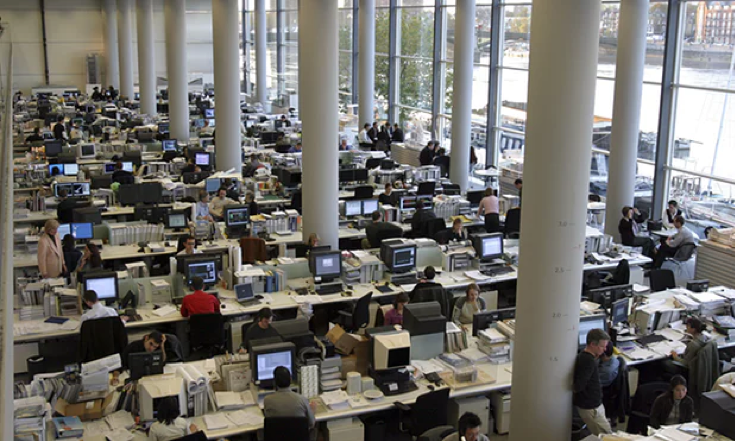 To break away from the office cubicle layout, companies started moving back toward a variation on of open-plan offices taken from the 1950s. Open-plan offices have become increasingly popular and make up approximately 70 percent of all offices. Understanding the history behind these changes to office design can help businesses make informed choices about what to implement in their own setup, and how the physical space of the office affects employee happiness and engagement. Fed up with working in an open-plan office? You’re probably not alone. Source: Photofusion/Rex Features. An open office layout can help increase the amount of day-to-day communication. Instead of having a meeting or walking to another cube, one desk occupant can simply talk across to the next. Beyond being able to hear the neighbor, one can also see if they are (1) at the desk and (2) if they are likely to be available – not on the phone or in a conference. The flexibility of an open office helps to break down the barriers between departments and hierarchies. With more chances to interact, teams can grow closer organically. Spontaneous lunch outings become more common, which can increase employee engagement and overall happiness. Familiarity in a non-work setting helps to build trust in coworkers and communication across departments. In an extreme example from my personal experience, a software company I worked at would stop work Friday afternoons to allow the entire staff to play games or just hang out. The open office and companion culture at this company helped developers, marketers, and even C-levels communicate better as a team. On the flip side, what if an important report has to be done by 5pm on a Friday while the other 20 people in the office are laughing and carrying on? The noise becomes a problem without sound barriers provided by cubicles and closed doors. In an open office, sometimes every phone call becomes anathema and the guy who used to be the water cooler pundit is always too loud and too close. A survey by Oxford Economics on open office plans said that 53% of those surveyed were less productive when they could hear ambient noise. Another study took this further and found that noisy offices can impair your ability to recall information or do basic math. The look of an office separated into cubicles is great if you love that grey and drab with bad lighting aesthetic. However, you have that physical and sound barrier between you and your coworkers. The open office layout removed those barriers allowing you to see and collaborate with your coworkers. This is its main selling point, well, that–and it often gives the office clean, trendy lines. The introverted and those sensitive to sound will quickly notice the drawbacks to all this openness. In one open office layout I sat directly across from the COO and very close to a Director in another. It’s nice to be able to see them and talk to them quickly without having to find their office and knock or wait for the door to be open, which makes you feel like another task in their project management software. The playing field does seem a bit more level without closed doors and formal meetings. Work-a-Day Normal Desks: Give employees the option to move around the office if need be, whether it’s a sitting, standing or adjustable desks. Large Tables: Let employees gather together and work at one large table together. This can encourage collaboration and team building. Conference Rooms: Sometimes all it takes is a closed door to give some much needed privacy. Phone Booths: Private booths are a great alternative for conference calls or recorded trainings. Couches: Who doesn’t like a comfortable couch to change things up? Let employees kick their feet back while they get work done. Multiple Lighting Options: Some employees don’t like overhead lights and some do. Have the option of lighting up one zone with and another without. Choosing between an open office or a layout that provides a little more privacy doesn’t have to be overwhelming. Remember to think about what works for your company, its culture, and the amount and types of engagement you want among your employees. Defining these pieces before redesigning your office setup will ensure you choose the office space that works for your team. Are you delivering an unbeatable employee experience? Discover how to engage your employees with personalization, the missing link in employee experience. Access Achievers’ white paper to learn more.